Yvonne’s 95th: Yvonne McAllister turns 95 today. 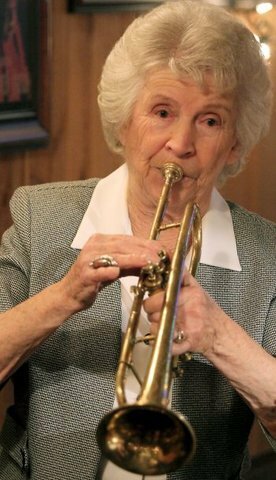 As she always does, she’ll grab the trumpet she bought in 1958, and she’ll play McCloud’s in East Bremerton, on the corner of Perry Avenue and Sheridan Road. Paint Your Heart Out: Artist Angela Perryman brings the paints, the location supplies the pints, and you get to take home the canvas. First up: 6 p.m. at LoveCraft Brewery on Fifth Street; next is 6 p.m. at Hot Java Cafe on Pacific Avenue; and next week, at 1 p.m. Nov. 26 at Hot Java for the little ones. Adults: $45, kids, $25. To reserve your spot, email clayworks_ceramics@yahoo.com or call LoveCraft or Hot Java. Tradition 5: Looking to see some amazing all-style dancing? On Saturday, breakdancers and hip hop artists will come to Bremerton for Tradition 5, an annual celebration and competition. At noon, the preliminary rounds will be held at The Eagles on Sixth Street. At 6 p.m. the final rounds will be at the Fountain Room inside the Puget Sound Naval Museum on First Street. Tickets are $10 and kids get in free. Bremerton Jazz Festival: All day Saturday, choirs and jazz bands from around the northwest will be performing at the Bremerton High School Auditorium. (The host 13th Street Jazz Band performs at 9 a.m.) For the main event at 6:30 p.m., Dave Tull — a drummer, vocalist and songwriter who’s even been featured on the TV show Family Guy — and Rebecca Kilgore, a song stylist featured on NPR and at Carnegie Hall, will perform. Tickets are $20 and can be purchased at the door. Kitsap Quiz Night: I host my monthly news quiz at the Manette Saloon on E. 11th at 7 p.m. Thursday. Join us; there will be free pie. Story Walk: And last but not least, the Bremerton Police Department will throw open its doors for our latest Kitsap Sun Story Walk, at 1 p.m. Saturday at 1025 Burwell Street. Tours will be provided and the event is free. Be sure to RSVP. *The fifth story on the Beat Blast is unabashedly about whales.